Facebook is a social network used by millions of people and because there are so many people on Facebook it has become a large target for hackers to get people’s personal information. Recently one hacker was able to access millions of phones numbers for Facebook members because of the ability to sync Facebook contacts with phone contacts. This is just one of the many different phishing attacks being done on Facebook members. I will show you several steps you can take to improve the security of your Facebook account. The first step is to ensure your security settings are setup. 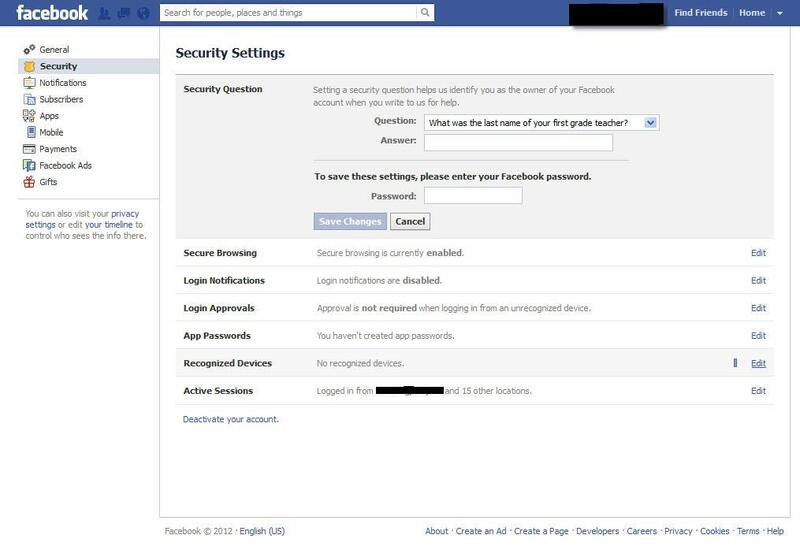 To access your security settings log into Facebook and click the down arrow on the top right next to your name. Then click on Account Settings -> Security the security tab is where you will check your security settings and make changes. The first setting you can choose to set is a security question and this would be used if you were to contact Facebook for help or to say your account was hacked. This is a helpful security feature to make it harder for someone to impersonate you when contacting Facebook. The next setting is called Secure Browsing this is an important security setting when you enable it you will connect to Facebook on a secure connection and the Facebook web address will change to https://www.facebook.com this means that while you are connected your data is secure and it also helps if you get a phishing scam that sends you to Facebook without the HTTPS that will tell you it is not secure and you should not click the link. 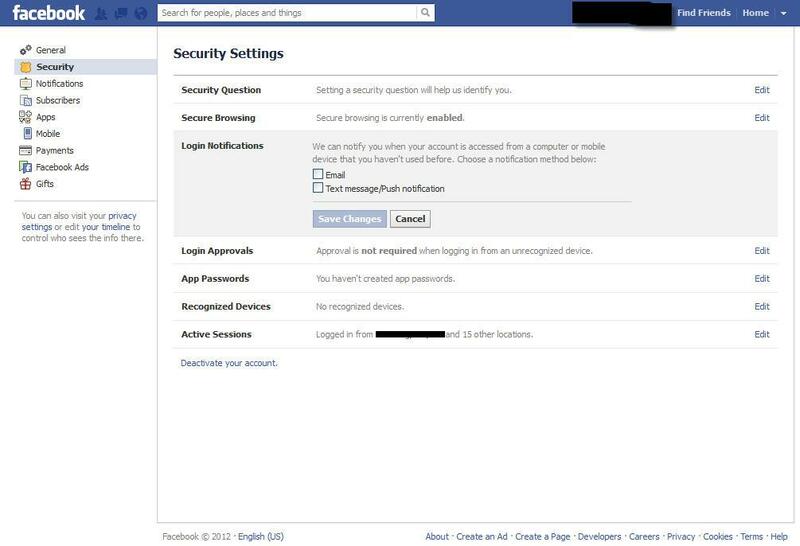 The next Account setting that you can set is regarding getting a notification when someone logs onto Facebook with your account from a computer or device that you have not used before. This setting is an optional one for me because I access Facebook from many different computers whether it be at school or at a family member computer. But for someone who thinks the will only uses a couple computers to access Facebook this is a nice feature just to let you know that someone has logged into Facebook from an unknown place. You can choose to get notified by email or text message, if you turn on this feature and find out someone is using your account you will want to quickly reset your password and contact Facebook. Along with Login Notifications you can setup Login Approvals which offer more security than just sending you a notification. When you enable login approvals you will setup a special pin and if you login to Facebook on an unknown computer you will be required to enter the pin to connect. This is a nice security feature but can become cumbersome if you use many different machines to connect to Facebook. To enable this setting you check the box and it takes you to a setup wizard that will send a security code to the phone you have setup with Facebook this code will let you finish setting up the Login Approval. I suggest you enable Login Approval and try it out to see if you don’t mind the extra step with logging in and if you don’t your account will be even more secure, if you don’t like the extra step you can easily disable the security feature. If you enable Login Approval you will need to setup App Passwords which create passwords that are needed to access apps. Some apps cannot work with the security pin you setup so they will need special passwords to work when you connect from unknown computers you must setup both or you may be locked out of an app. The last tab under account settings that you will want to check is Apps this will show all the apps that you have granted access to your account. These will include apps inside of Facebook such as games and fun apps like Poke, this will also include any 3rd party mobile and web apps that you have logged in with Facebook or connected with Facebook. 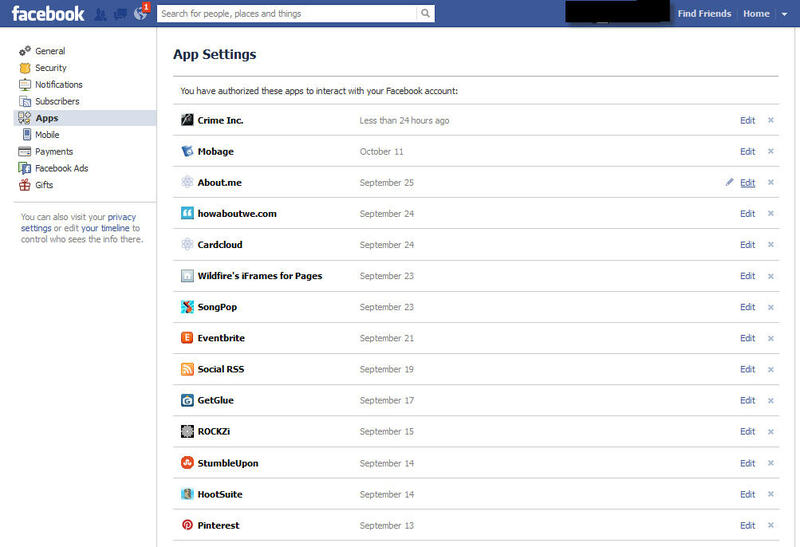 The Apps list is very helpful because you may not have realized you authorized an app to access your Facebook account and may want to revoke those rights. The list also shows when the last time you used the app and if there are apps listed that you haven’t used in several months you should think about removing them. When you select an App listed it will show you what the app has access to as well as what the app can do for you, who sees the posts done by the app, and if the app can notify you. You always want to give an App only the permissions it needs and nothing more. It is good to check this tab every month to see what App you have allowed and to remove any apps or permission you do not need. That are all the Account settings you should worry about to improve your Facebook security. Check out my next article when I talk about changing your Facebook Privacy settings to protect your account and personal information. 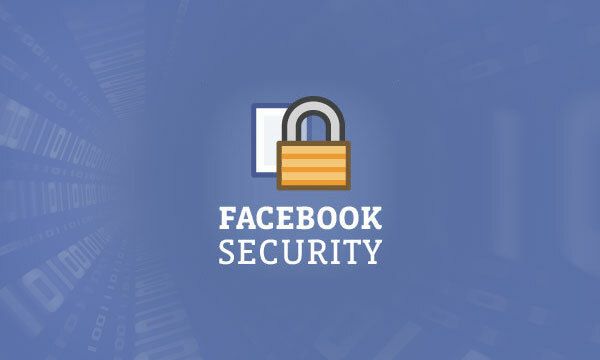 Let me know if you have any questions regarding Facebook security and for more information about Account settings go to the links at the bottom of the page.